Tyvek wallets protect important documents during transit and are extra wide to allow top-tab file folders to fit neatly inside without bulging outside gussets. 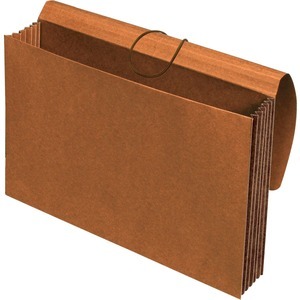 Standard file folders fit nicely inside these extra-wide redrope wallets with no interference with the sides. Extra-long flap assures adequate coverage even when the wallet is full. Fully lined, Tyvek-reinforced gussets with an added rollover feature protect against tearing. 5-1/4" expansion holds up to 1,200 legal-size sheets.